Every legend has some basis in fact. And when it comes to the controversial legend of Santa, here are facts about him that even the most dubious will find compelling. Like many internationally famous individuals, Santa reached his greatest prominence far from the borders of his original hometown. He started in what is today the Middle East nation of Turkey as Saint Nicholas, archbishop of Myra. How he ended up at the North Pole as jolly old St. Nick is lost to the dry pages of history yet unwritten and likely unknown. But let it suffice to be say that the red suited one had to travel about as far as any person in history before he settled into his final career. 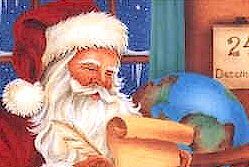 Little is actually known about the historical Saint Nicholas, but the legends that surround him provide the template for the character we now know as Santa Claus. What we do know is this: he was born around the year 245 A.D. to wealthy parents. He devoted his life to the church, eventually becoming the archbishop of Myra. He was tortured for his beliefs until Emperor Constantine changed the official religion of the Roman Empire to Christianity. And he died on December 6, sometime around 350 A.D. The Catholic Church has set aside that date as a feast day in his honor. But even much of this information is suspect. The main source is a biography that was written by a monk some five centuries after he died. More important then the facts, though, are the legends that have grown up around him. Most of these are the run-of-the-mill saintly miracles, such as him calming a particularly nasty storm. But there is also a saintly tale of Saint Nicholas resurrecting three boys who had been murdered and then pickled. (Let's hope the killer went through the trouble of pickling in order to hide his crime and not to keep them fresh for winter consumption). Still, there are several stories that exist that show Saint Nicholas performing acts that we now come to associate with the lovable figure of Santa Claus. One of the most interesting of these tells of his convincing a group of thieves to return their stolen goods, thus causing him to become the patron saint of thieves (not patron saint in that he helps them rob but, rather, in that he helps them repent). This seems fitting considering Santa Claus, who sneaks into our houses in the wee hours of Christmas morning and leaves us presents, is a sort of anti-thief, undoing the deeds of those nefarious people Saint Nicholas is said to look after. The most famous tale, though, recounts the story of a once wealthy businessman, who, having lost his fortune, decided to sell his three daughters into prostitution to raise some money. Hearing of this, Saint Nicholas went to the man's house at night and threw three bags of coins into the man's window, one for each of the daughter's dowries. The young women were thus able to find good husbands and avoid the degrading lifestyle to which they seemed destined. Cementing the connection to the modern day Santa Claus, some versions of this story have Saint Nicholas arriving with the third daughter's gift bag but, finding the window shut, was forced to drop her coins down the chimney and into a stocking hanging on the mantle to dry. This not only seems physically unlikely, but so absurdly similar to today's popular Christmas traditions that it sounds almost certainly false. The legend of Santa Claus grows with time. Whether your own belief is that he is real or that he remains a growing figure of modern mythology, there is no doubt that Santa Claus impacts society with each passing season. His name is associated with both good and evil. As are so many honored names of legend.